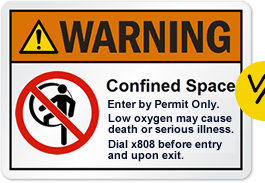 OSHA sign standards have changed to now allow designs that are based on the ANSI Z535 label and sign standards. That means that there are now, officially, two different safety label or sign design standards that are typically used. Let’s explore when each type of label design is best and if you need to switch your warning label designs to ANSI label guidelines. Increased legibility for longer warnings and bilingual messages. Clearer for consequence statements and detailed hazard avoidance statements. Large library of stock designs at low costs. Short hazard statements quickly understood. Long history (in factories) means increased worker familiarity with these designs. Consistency with still-prevalent traditional OSHA safety sign designs. Increased time and costs to design labels. Overreliance on symbols and labels - in lieu of training. "Danger" signal word has been overused (and thus its impact diluted). Difficulty in conveying a complex set of warnings, instructions and consequence statements. It is our belief that, even though safety labels based on ANSI guidelines are likely to become more prevalent over time, many thoughtful safety officers will continue to use the traditional OSHA designs for their safety labels. These two different designs systems (the ANSI Z535 designs and the traditional OSHA designs) – as well as many other warning label designs - will continue to be produced and will continue to have entirely valid applications. 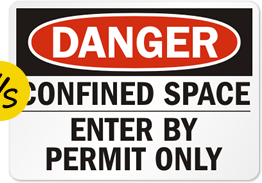 Compare ANSI and OSHA definitions for Danger, Warning, Caution and Notice. Do the ANSI Z535 Designs Enhance Safety?